Many people come to see me because they experience pain, usually physical pain. However this often affects or affected by mental health more than they realise. Mind and body are not disconnected. Pain causes stress, just as much as stress causes the body to tighten and increase pain. Physical pain is often the last resort for the body, after it has been sending other signs of dis-ease that you have not noticed or have suppressed. Whether you are dealing with physical or emotional pain. I use both body / physical and mind approaches to help improve your condition and mental health and attitude. Although I have trained to various levels in the following forms of mental health therapies and care techniques, I do not practice these as stand-alone therapies. I have found a combination of body work / physical therapies / approaches, to be much more effective than using each therapy on its own. The combination of treatments used depends on the main problem which presents itself at each session as well as what you want to achieve. Counselling, psychotherapy and EMDR are usually considered for people who feel they have a problem such as depression, anxiety arising from life such as bereavement, relationship difficulties, domestic violence or the after effects of childhood sexual abuse. My approach helps deal with such issues and addresses other areas before they become problematic. The latter are often seen as everyday issues which people think can’t change, but drain their energy and passion for life. These could be guilt, lack of confidence, exam nerves which are often considered ‘normal’ but really stop you enjoying your life and achieving what you really want. Counselling is a talking therapy which allows you to express whatever is going on in your life. Often sharing a problem and how you feel about it, with someone who is empathetic and completely separate from you and the issue, (as opposed to a friend or relative – though this is also helpful) helps to get a better perspective on your situation. The information shared is confidential, so there is no risk of anyone, such as work or friends, finding out about your issue(s), unless you choose to speak to them about it. A counsellor does not offer a solution or answer to your problem however by asking questions the counsellor might help you shed light on how you can move forward. From my experience of counselling, as a young adult, it was comforting to talk to someone. I was new to Swindon and had no friends in the area at the time. Though talking to someone impartial and supportive helped give me some understanding and perspective, it did not change how I felt, nor give me tools to deal with my situation. It did not fundamentally change my mental health. Though I use counselling skills, my approach offers more suggestions, possible areas to explore than a session with a counsellor would. I also use techniques like those of Elisabeth Kubler Ross. This is why I have not pursued the full counselling training and chose EMDR, mixed with the other modalities listed here, as the main way I help people deal with upsetting situations and emotions. EMDR deals primarily with upsetting emotions. The process used releases unwanted emotions permanently. When the process is finished you will feel completely differently about the event that triggered the upsetting emotion. NLP is all about understanding how the words and language we use, in our everyday life, helps us or hinders us. Understanding how our brain processes language and how others may process it differently, means we can learn to communicate more effectively. We can also change our self-talk and reduce self sabotage. When we express ourselves differently, we can get our message across more effectively and get more of what we want. The latter is particularly helpful when bringing up children. You might known that when you tell a child not to do something, they end up doing it! That is because of the way we phrased our message. Asking a child not to walk in the mud, for example, (and their brain goes… mud, what mud, where, what fun, mud!) rather than asking them to stay close to us and stay on the path, which draws their attention to the path and they don’t notice the mud. 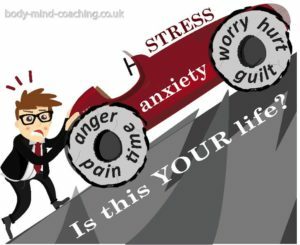 Life Coaching uses tools and techniques from psychology, sociology, counselling, positive adult development and more. Examples for some of those tools are Wheel of Life Coaching, NLP, Personal Development Planning. The main difference between coaching and other areas, concerned with the human well-being, is that it is about what the client needs. A Life coach is more interested in actions you can take, rather than on identifying a past issue. Clients can reasonably expect to gain confidence, insight, encouragement and inspiration. Professionals enlist coaches to accelerate their careers, getting help with things like making decisions and achieving self-awareness. Coaches can provide honest, unfiltered feedback, which is hard to find. Coaching is a process of you helping yourself with a little guidance. You get support to turn your dreams into goals, your ideas into plans, and your thoughts into actions. My coaching approach is more like that of a sports coach. I focussed on finding out what you want and where you would like to be which determines what you need. If you have an injury, my treatment programme will be different if you want to get back to gardening or train for a triathlon. I also help you understand what you can do to help yourself. Also known a psychophysical integration, it helps release unconscious holding patterns held in the body. When you become aware of the patterns, you are then better able to release them consciously. Sessions are more than just a treatment. They are about self-discovery, finding ways to move more freely and do more with less effort. This is very helpful to deal with stress and regain energy. Read more. As the name psychophysical integration implies, it’s a physical treatment on the body that affects your mental health.